This entry was posted in Sara's Photo-a-Day Project and tagged climate change, global warming, ice skating, January, Kentucky, Lexington, photography, photos, skating rink, weather, winter. Bookmark the permalink. Oh, we miss you, Mike. How great to hear from you. Hope you are getting settled in Geneva. I bet they do some REAL skating there on the lake! This photo is the epitome of the winter we’ve had here in MN too! What a strange season it has been. My daughter is extremely frustrated that in order to really enjoy the new ice skates she got for Christmas, she needs to pay to use an indoor rink. It’s bizzarre, isn’t it? Especially that you all wouldn’t even have a lot of could weather there. That’s my kind of winter…..ice skating in my sweater. We too, have had an unusually mild winter so far, except for a couple of bitterly cold days recently. Wow, even up in Canada. Something weird is definitely happening to our planet’s weather patterns. Yesterday, in the Big Apple, the temperature reached an unseasonably mild 62. It last snowed out here in October, the first time it snowed in October in the almost 30 years I’ve been nesting here. I don’t miss walking down the street in white-out conditions and beaning myself so hard in the forehead off a low hanging air conditioner I’m sporting the GE logo on it for the rest of the day. Yes, that really did happen to me. Good God–talk about a LAME ADVENTURE! Did you blog about that? I may not have been reading you back then. (Thanks again–another LOL moment!) We love you, V! Okay, that was too damn funny. Sorry for your head, but——–Good God, your telling of it cracks me up (no pun intended)! We’re having a similar winter except for that one good snowfall. I love you, Robin! Your comments make this so DAMN fun. What a great education in photography! It looks like a great day there. It was a beautiful day–only it shouldn’t have been. Kind of a sad double bind, isn’t it? I don’t know. It’s getting awfully late now not to have had any accumulation–only the dusting in that photo from the other day–so you may not have to dream too hard. It’s just so weird. 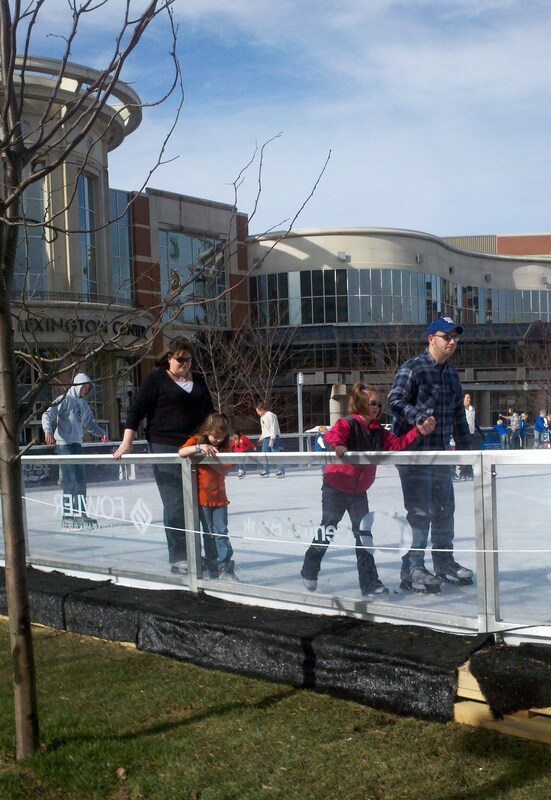 Its wonderful to see skaters not bundled up with mitts etc! I know. It’s just so strange this time of year. It’s a bit chillier today, however. Mitten might be in order this evening, I’m afraid. It does look too mild, but I’d still like to tell the girl in the t-shirt to put a sweater on! That building looks beautiful. My mom reports no snow on the family farm in South Saskatchewan; it was 48 here in West Michigan today. Reports of snow coming this week .. I still feel like lady winter is just going to wake up and spank us. I hear we may get a little snow here later this week, as well. We’ll see. Glad you are prepared. Surely to God winter will arrive at some point. That looks like a delightful way to spend the day, but I wonder if the ice got slushy. I don’t know. They must have some means of keeping it frozen, as the weather here has been above freezing most of the winter.